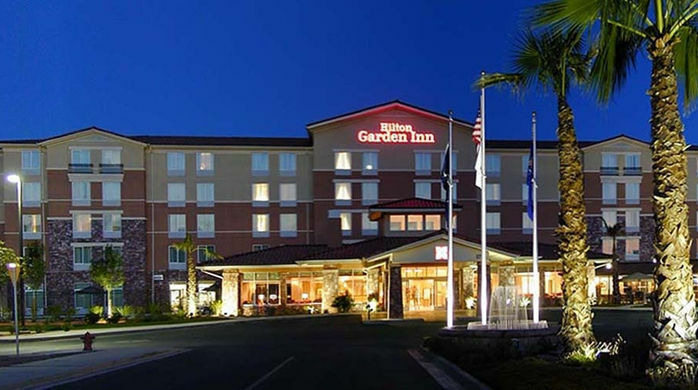 The Hilton Garden Inn St. George hotel is located adjacent to the Dixie Convention Center in St. George, Utah. The hotel features 150 guestrooms and suites, each equipped with a spacious work desk, two phones with voicemail and data ports with complimentary high-speed internet access. A hospitality center in each room includes a microwave, refrigerator, coffeemaker, iron, ironing board and hair dryer. The hotel also offers a 24-hour complimentary business center, fitness center, outdoor pool and whirlpool and a 24-hour Pavilion Pantry. The on-site restaurant, Great American Grill, serves breakfast and dinner and the hotel has a separate private lounge called "The Office".